Venus Express has arrived at Venus after a 50 minute burn of the main engine and entered orbit around the planet. 24 hours to 12 hours before VOI, spacecraft controllers will command Venus Express into its final configuration for the burn. This manoeuvre lasts about half an hour and rotates Venus Express so that the main engine faces the direction of motion. 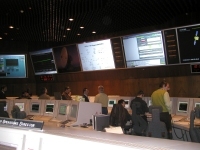 During the 24 hours following the orbital capture, time will be dedicated to reactivate all spacecraft functions, including all internal monitoring capacity.